View our current fundraising brochure to see the candle scents available. View our current fundraising brochure to see the fragrances available. Your items will be shipped by FedEx to your home or business. You're welcome to call our office anytime should you have questions about our products, to check on the status of your shipment or if you have any questions about our fundraising programs. We changed our name to La-Tee-Da Fundraising! We still offer the same candles you've loved for years known as Celebrating Home, and Home Interiors! 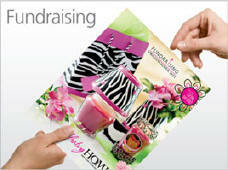 We are proud to offer you an exception fundraising program offering a variety of fundraising brochures. Our programs offer 50% profit, free shipping, free pack-by-seller and so much more! Call us today to request free information. We'll ship your brochures today!